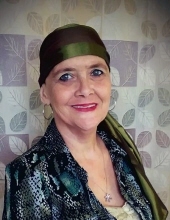 Regina Ann Varney Hicks, 52 years of age of Bluefield WV, passed away on Tuesday, February 19, 2019 at her home surrounded by her family. Born September 20, 1966 in Richlands, VA she was born the daughter of Leroy and Barbara Mullins Varney of Raven, VA.
Regina was of the Christian faith and enjoyed working on crafts, crossword puzzles, coloring, reading, fishing, riding motorcycles and spending time with her family. Loving daughter, mother, sister, grandmother and aunt. Those left to cherish her memories include her parents, Leroy and Barbara Mullins Varney of Raven, VA; three precious daughters, Nina Gibson and husband Michael of Bluefield, WV, Heather Fields (Adam) of Bluefield, WV, and Sadeana Allen (Dustin) of Knoxville, TN; three brothers, Ricky Varney of Pounding Mill, VA, Tim and Mark Varney both of Raven, VA; step-grandmother, Orpha Mullins or Raven, VA; and her husband, Aaron Hicks. She is also survived by eight grandchildren, Mahayla Allen, Isabelle Gibson, Teegan Gibson, Alyssa Fields, Robert Fields, Jr, Garrett Allen, Rodney Allen and Lucas Allen; numerous nieces and nephews, and a host of friends. A funeral service for Regina Ann Varney Hicks will be conducted at 7:00 p.m. on Sunday, February 24, 2019, at Shortridge-Ramey Funeral Home Chapel of Keen Mountain, VA with Reverend Troy Lester officiating. A committal service and interment will take place on Monday, February 25, 2019 at 1:00 p.m. at Green Hills Memory Gardens in Claypool Hill, VA. Active pallbearers will be Michael Gibson, Adam Price, Dustin Varney and Dustin Cooper. The family will receive friends on Sunday, February 24, 2018 after 6:00 p.m. with the funeral to follow at 7:00 p.m. The family of Regina Ann Varney Hicks have entrusted the care of their loved one to Shortridge-Ramey Funeral Home of Keen Mountain, VA.
Family and Friends to meet at the cemetery at by 12:45 p.m.
"Email Address" would like to share the life celebration of Regina Ann Varney Hicks. Click on the "link" to go to share a favorite memory or leave a condolence message for the family.